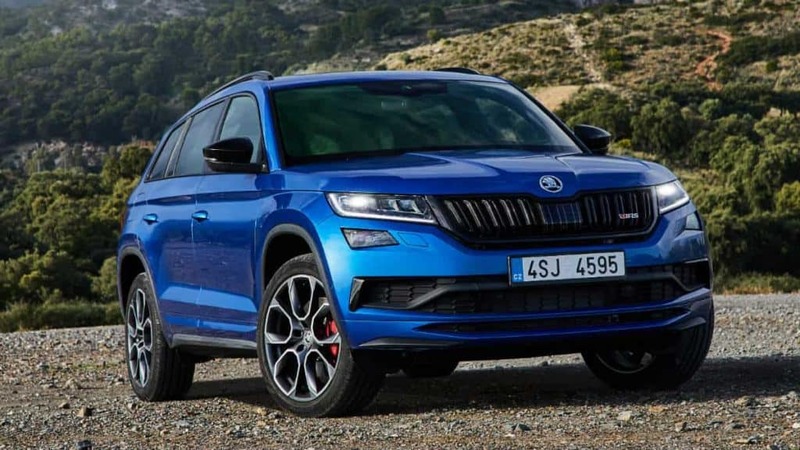 The very first SUV in the Czech producer sport line, Skoda Kodiaq RS. 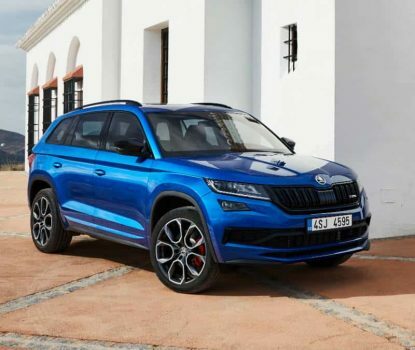 The Skoda Kodiaq RS is the new spearhead of the Czech automobile supplier suv market attack. The performance model is powered by the Skoda’s most powerful production diesel with an output of 176 kW (240 PS). It showed its capability with a record lap time on the Nürburgring’s Nordschleife in the seven-seater SUV category. 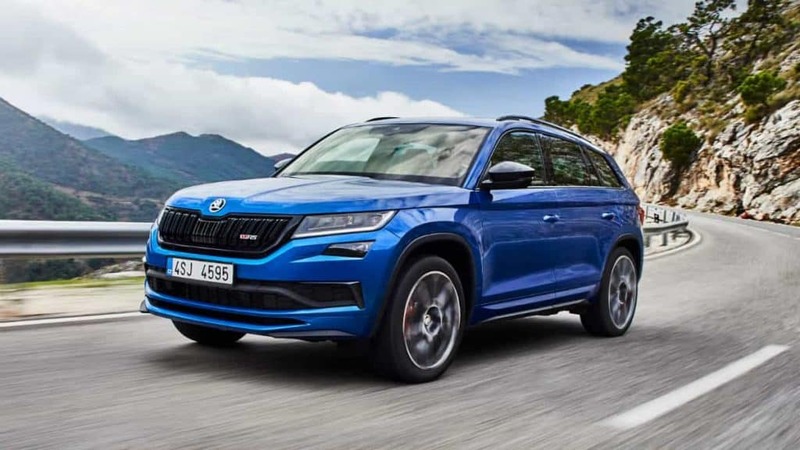 Skoda Kodiaq RS features all-wheel drive as standard and gives remarkable characteristics both on and off the road. It combines a modern way of life with sportiness, the excellent mix of dynamic driving experience and also exceptional suitability for everyday usage. From shopping or a family journey to sporty use on- and also off-road, Kodiaq RS is well prepared for virtually anything that day-to-day life can throw at it. The Czech brand’s suv is targeted at active consumers, they can appreciate their modern way of living and highlight it with the cars sporty look. Kodiaq RS can transfer mountain bikes to a remote hill and handle moving house on a little scale. 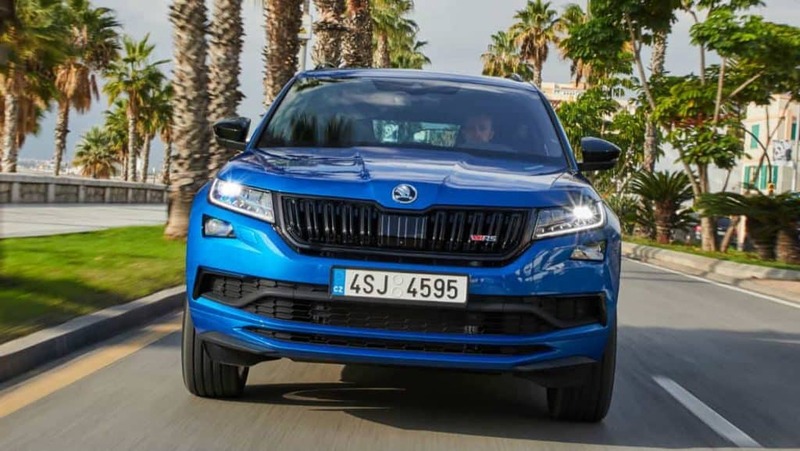 The engine of the Skoda Kodiaq RS is a new landmark in the history of the brand from Mlada Boleslav, with its power output of 176 kW (240 PS) and also torque of 500 Nm, It features two-stage turbo technology, the very first is a high-pressure exhaust gas turbocharger with a small turbine, a little compressor wheel and electronic turbine blade control. This permits a prompt response, at all engine speeds. The second turbo is a low-pressure charger. With its large turbine and compressor wheel, it accomplishes a significantly higher boost of approximately 3.8 bar at high engine speeds which enhances the engine outcome considerably. At reduced engine speeds, the chargers operate in 2 phases. The low-pressure one is in charge of the pre-compression of the air going to the high-pressure charger for the main compression. At high speeds, only the low-pressure charger is utilized in a single-stage mode, this system guarantees continuous power with brief response time and high top values. The all-wheel-drive SUV accelerates from 0 to 100 km/h in 6.9 seconds as well as has a top speed of 221 km/h. 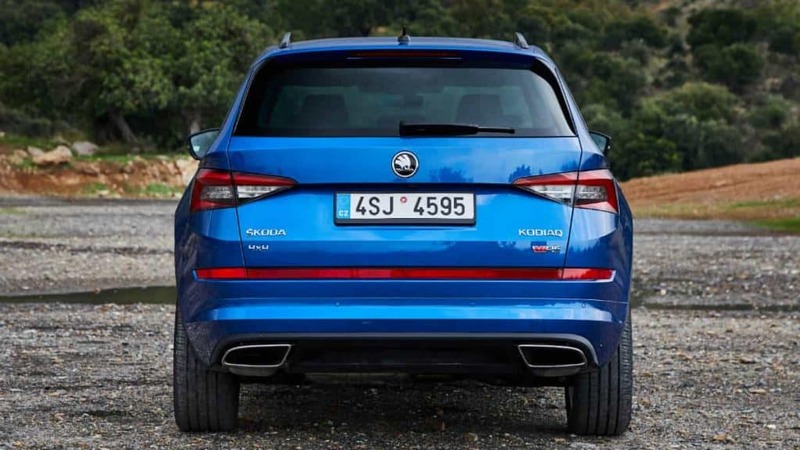 Kodiaq RS is fitted with an oxidation catalytic converter and a diesel particulate filter straight on the engine as well as an SCR catalytic converter for exhaust gas treatment and meets the Euro 6d-TEMP emissions standard. With its intelligent four-wheel drive, Kodiaq RS is completely equipped for a variety of needs on- and also off-road for all weather conditions. 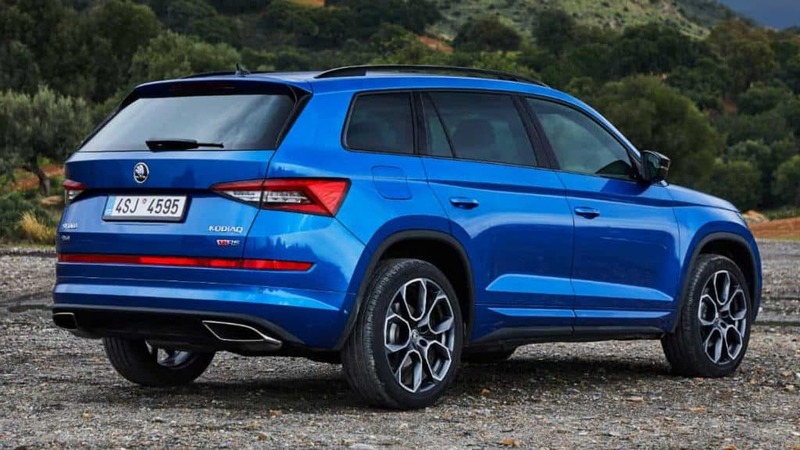 The 7-speed DSG has actually been specially developed for use with biturbo diesel and its torque of 500 Nm, it transfers the power gently and conveniently Thanks to its all-wheel drive, the Skoda Kodiaq RS has the best-possible grip in any conditions, giving excellent driving dynamics, good off-road capability and safety in all weather conditions. The RS comes geared up with Dynamic Chassis Control as standard, which supplies optimal shock absorption to suit the surface and driving style. The system, which is also used in various other models, was specially adjusted to the sporty capacity of Kodiaq RS . Driving Mode Select permits the driver to select from Eco, Comfort, Normal, Sport, Individual and Snow modes. 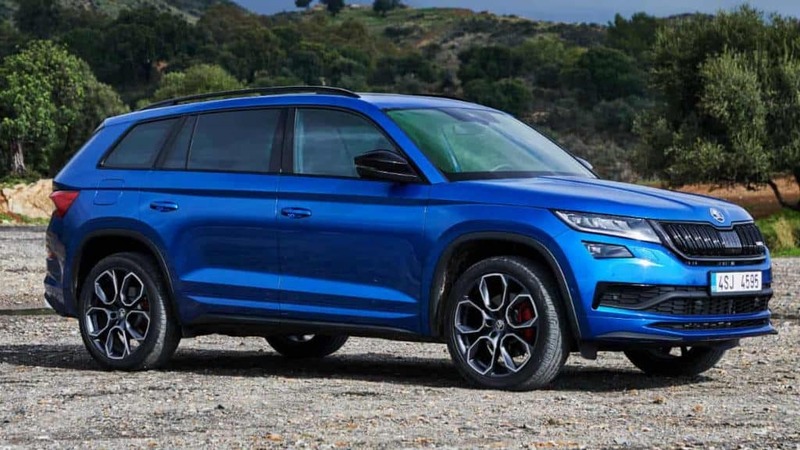 The Skoda Kodiaq RS emerges as a member of the RS line, which is designed for sportiness. With a dynamic style, brand-new Xtreme 20-inch alloy wheels as standard, and bright red brake callipers, RS is making a statement in a segment. RS also is equipped with 17-inch brakes on all wheels compared to the standard Kodiaq 16-inch brakes at the rear. Skoda uses cutting edge LED technology for its head and rear lights. The first suv in the sporty RS family is also the first to offer the metallic Race Blue finish. Crystal Black will be added to the range of colors available for the RS, which, in addition to red and white, also includes various shades of grey and black. Being the sporty variant, RS remains a true Kodiaq and nicely combines its sporty lifestyle with lot of comfort, a huge amount of space for up to seven passengers and the above class average level of practicality. The sporty aptitude is stressed by Alcantara upholstery with contrasting stitching for both the seats and the trims, the instrument panel with carbon decor and the new RS logo. The flexibly programmable Virtual Cockpit, which comes as standard, adapts in nicely with its modern look thanks to its carbon-effect background and offers an additional views. The Skoda Kodiaq RS also brings multiple Simply Clever features that make every day use easier, including the umbrella compartment in the front door and misfuel protection as standard. As with every Kodjaq, the dynamic RS model comes as five-seater in a standard and can be increased to seven in option. The five-seater offers an impressive 725-litre boot with the seats in position and 1,960 l when the seats are folded down. With all of its seats occupied, the seven-seater has a boot capacity of 230 l; this increases to 715 l with the third row of seats folded down and 1,950 l with the second and third row of seats folded down. 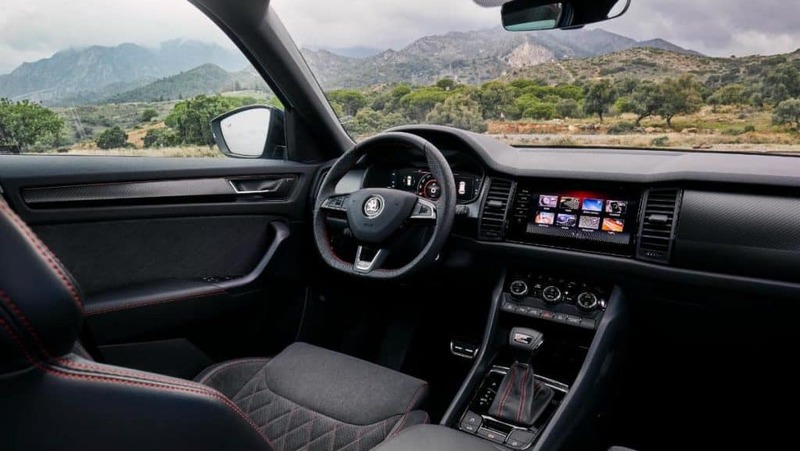 As standard, Skoda equips its sporty suv with the Bolero infotainment system with Bluetooth connectivity as well as SmartLink+ technology. With an integrated Internet connection, the optional Amundsen and Columbus systems allow access to Skoda Connect’s mobile online services. In combination with Skoda Media Command 2.0, the free Skoda app enables the functions of the Amundsen and Columbus infotainment systems to be controlled on up to two paired tablets. A Phonebox with inductive charging for mobile phones is available as an option. This wirelessly connects a smartphone to the car’s aerial and charges it inductively in line with the Qi standard, providing the device is technically compatible. An optional package includes an additional front USB port, the Jumbo Box’s rear USB port and a 230-V socket between the front seats for the rear passengers. The In-Car-Communication (ICC) makes communicating with each other in the car easier by using a microphone to capture what is said by the occupants of the front seats and amplifying it in real time through speakers in the rear. In the usual Skoda style, the Skoda Kodiaq RS offers number of additional features that make everyday life easier. The standard equipment includes the removable and retractable boot cover and boot nets. Classics such as the umbrella compartment in the front door and ice scraper in the fuel filler flap (for selected countries) are also standard, as is a ticket holder on the A‑pillar on the driver’s side. The virtual pedal, electric tailgate incl. tip-to-close function and the removable LED torch in the boot are available as an option.